Why we use water-based, and green products. Dina and I are both moms, first and foremost. And so far, all of the homes we’ve worked in have had children of one age or another. 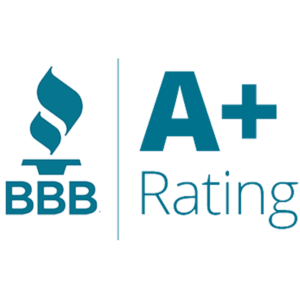 The health of our customers and their children, we take very seriously. That’s why at 2 Cabinet Girls we made the decision to go as green as possible. With so many fantastic alternatives to oil-based and potentially toxic paint these days we’d be crazy not to. As little as 10 years ago you’d be hard pressed to find good low-voc paint. But with the increase in VOC regulations and general awareness of the toxicity of paint fumes, almost all paint manufacturers have created safer, healthier alternatives to oil-based paint, while maintaining durability and finish. That’s how we chose Sherwin-Williams’ ProClassic Interior Acrylic Latex Enamel for cabinet painting. 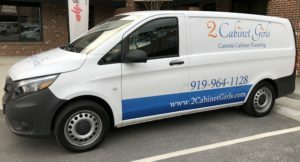 We wanted the benefits of a waterbased enamel, but didn’t want to sacrifice adhesion, durability and block resistance. 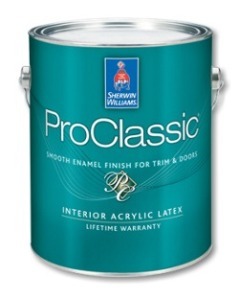 ProClassic Acrylic Latex is the perfect choice. The satin, semi-gloss, gloss and high gloss finishes meet VOC regulations. Yet it delivers a high-performing, non-yellowing finish that withstands even the toughest wear and tear. But what’s underneath the Sherwin-Williams ProClassic paint? Primer. We tested a dozen different primers before finding one that met all our strict requirements – low VOC, low odor, premium bonding, smooth finish, and sprayable. 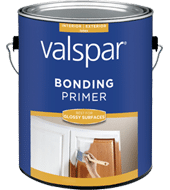 Valspar’s Interior/Exterior Bonding Primer met most of our requirements, but it wasn’t as easy to use in our sprayer. And after using it on a job with lots of tannin bleed we found that we needed lots of extra coats to seal in the tanning. A big time waster! We’d definitely use it again on jobs without tannin bleed – laminate/melamine is a perfect choice for this primer. 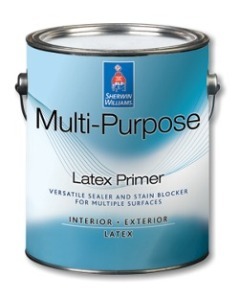 Another one that almost made the cut was Sherwin-Williams’ Multi-Purpose Latex Primer/Sealer. We liked that this primer meets the most stringent VOC requirements, and that it dried ultra smooth, but we had trouble with adhesion and repelling when using it on both wood veneered cabinets, and solid wood cabinets. After calling the Sherwin-Williams help line they said maybe we had sprayed it on over damp wood. So on our next set of cabinet doors we took extra precautions and made sure all the surfaces were completely dry. But no luck. It still felt smooth to the touch when dry, and it covered well, but it left us thinking we needed to keep looking for a better alternative. Sherwin-Williams Multi-Purpose Primer/Sealer – repelling problem. So after years of furniture painting I decided to go back to a brand that I knew and loved – Zinsser. Zinsser makes dozens of primers, so how did we chose the formula to use? 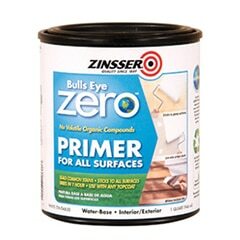 We decided to start our testing with their Bulls Eye Zero Primer-Sealer because it has zero VOCs. This “extreme green” water-based primer contains no VOCs or hazardous pollutants and doesn’t compromise on blocking, sealing or hiding power. And it dries fast and smooth. After our very first use we were sold. 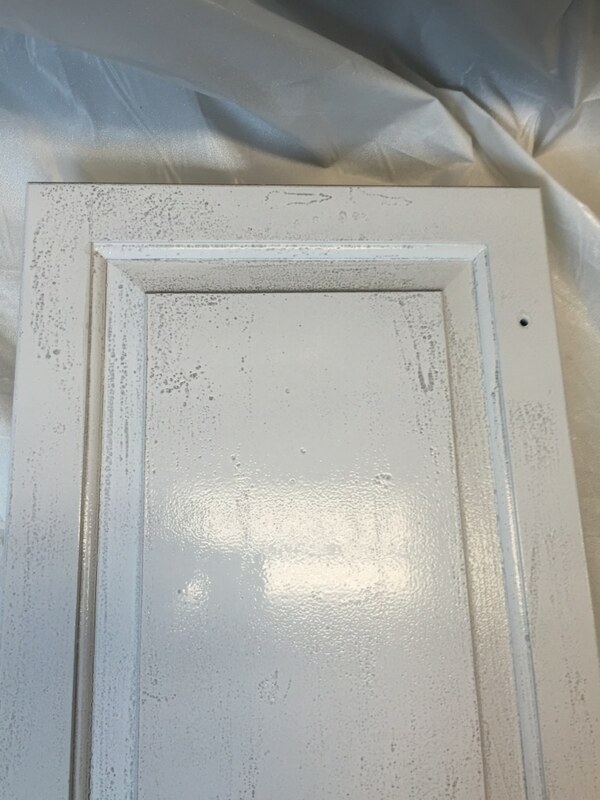 This one product met all our strict guidelines, with the best part being that we don’t have to sacrifice the health of our customers’, or ourselves, to achieve the right finish. It’s a win-win!